Christmas is one of my favourite holidays of the year. I look forward to the Christmas holidays for quality family bonding, delicious food and great conversation. Hand in hand with the holidays is gift giving. Gift giving can be a daunting task that creates anxiety for many. 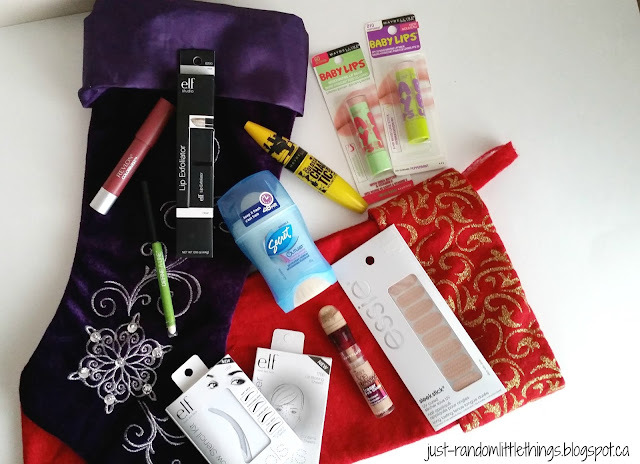 To make things a little easier, I thought I would share my ten beauty stocking stuffer ideas for the makeup enthusiast in your life! 2. Deodorant - everyone needs this! What are your favourite beauty stocking stuffer products? Hi beauties! My name is Usha and I originally started “Just Random Little Things” to talk about the stuff that I love. Since then, it has grown into something much more special, where I talk about my passion for beauty and wellness. I don’t spend hundreds of dollars on the latest products every month, but I love glam and feeling fabulous! Don’t get me wrong, I believe in splurging from time to time! You won’t find a well-stocked makeup room; in fact, you won’t even find hauls or a full faced makeup tutorial. I simply want to bring you beauty and wellness advice that you can use in your everyday life. Stop by each week to get your dose of beauty and wellness chitchat! Wait... also don’t be shy and say hi by connecting with me on social media!